I can recite the names of over a dozen American presidential candidates. Not because I'm that interested in American politics, but because I've been added by them on Twitter more times than I can count! Political jokes aside, I've been added now by so many Twitter bots, and I'm sure I'm not the only one. The thing that bugs me most about it though is the fact this is happening despite the location parameter that's on my profile: I've said I'm in Singapore! How hard would it be for a person writing these bots to push their favoured political candidates to ignore people who aren't living in the United States? Unless they just don't care and are just using the shotgun approach. Insert witty pun joke about gun control here. 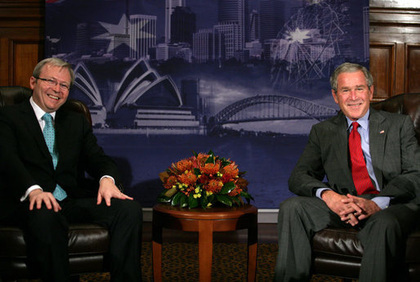 Australian Prime Minister Kevin Rudd in Sydney attempting to bring up with George W. Bush the issue of American presidential candidates spamming Australians on Twitter, with seemingly little success. Now that I'm using Twhirl as my desktop Twitter aggregator on my Mac (which shows private messages) I'm thinking of just creating a smart email folder that any Twitter messages get marked as read and filtered into. When I have to sort through thirty or so messages a day from Mark Huckabee, Ron Paul, John McCain and Chris Dodd I think it's stopped being funny. Actually nah, it's still pretty funny :). Older post → The super wicked evil 666 post!